Before we start to talk about what Griffin Theme has to offer, i’d like to tell you that even though Griffin is packed with a lot of features, but when you install and activate it on your website, all you need to do is to setup your menus and then you are absolutely ready to go. You don’t need to do anything else, you don’t have to configure anything. Of course unless you want to. So You’re website will be up and running in no time, which i believe to be an advantage. You can switch between these nicely made presets, anytime that you want. Even though each of these presets come with a beautiful background that matches the colors of the preset, but you also have the option to customize the preset background the way you like. If you are a fan of Flat design then you are in luck, because 4 of these presets are Flat. And if you do not like Flat design, then again you are in luck, because the Prestigious Preset is packed very beautiful shadows and features a nice non-flat shadow and color combination. Griffin is designed using HTML5 and CSS3 and i believe you will definitely enjoy it’s appearance and features. Griffin is absolutely responsive. Do not worry about the size of the device that your users are going to use when viewing your website. Everything will appear nice and smooth on all screen sizes. But you also have the option to turn Responsiveness off if you’d like to do so. Griffin is Translation Ready. It means that you can easily translate it to any language that you desire using the standard localization method that WordPress provides. If you use Griffin and you want to make a Contact form, you need absolutely nothing. Why? because Griffin is already equipped with a nice Contact Form template. You set if you want your Contact page to be FullWidth or to have a sidebar. you want to have a nice SiteMap? Then again Griffin gives you the right page template to make a SiteMap either. Griffin also has a 404 page which does a nice job helping your lost users to search for their desired content and get back on track. With Griffin you have the possibility to use 5 different kinds of boxes via very simple shortcodes. You don’t need to write any confusing code or style. Griffin also has two different sets of buttons. You can choose between 5 color sets and you have the option to use icons with buttons ( or not ). Everyone likes font icons, and all of us love Font Awesome icons. right? With Griffin You can use Font Awesome icons with the help of very simple shortcodes. It was never easier to manage you website without the need for any extra plugins. As you may have noticed, by default the style of posts list in home page and any archive page is Masonry. But if you do prefer the simple blog design for your posts, Griffin also gives you the option to turn this layout off and use the simple treditional blog layout for your posts list. If you like to have a long and nice list of subscribers and you don’t know where to start, well the best place to start is to have nice Newsletter functionality in your website. Griffin is equipped with Two NewsLetter Layouts, one to place in your sidebar and one beneath your blog posts. so that you can make sure you’ll get most of the subscribers. You also have Many kinds of settings to make the Newsletter subscription areas work with different subscription services such as MailChimp and FeedBurner without a problem. Gravity Forms Plugin is awesome and we know it either. You can use Gravity Forms in Griffin without worry. Griffin is able to generate QR codes and show Short Links for each of your posts. This way everyone can have access to your posts with a nice short URL with your own website address and also everyone can open your posts from their portable gadgets using a QR code scanner. You also have the option to set this feature On/Off. It’s always a good idea to let your readers know more about your website authors. In order to do so, Griffin has the ability to show a box displaying all author related information to your readers. With the help of this box, not only readers can get to know the author, they also can connect with the author and continue reading other posts written by the same author. Which is always good to make more visits and get a little more popular day by day. Of course, just like so many other options, this can be turned off either. Griffin also comes with a beautiful accordion slider and a News Bar. Both these features are handy and of course the News Bar can give you more and more visits per user on your website. Both the Slider and the News Bar has their own set of options and you can set them to be populated the way that you need them to be. But if you are not a fan of sliders, you also have the option of turning off the slider for both home and pages/posts separately. You have access to 5 different widget areas in Griffin. 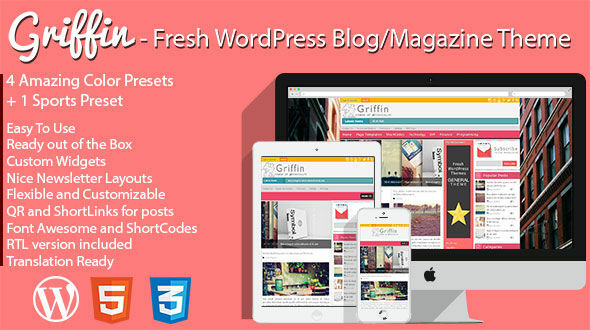 Griffin gives you the possibility to have different sets of widgets for home and posts/pages. So you don’t have to use the same widgets throughout your website. You can also place different widgets in your website footer. But this feature can also be turned off if you want to have a simple yet lovely footer without any widgets. Also if you have any questions, feel free to ask in Comments, i’ll do my best to answer ASAP.